Home » Posts » Attentionology for K-5 Teachers » Create or Borrow a Cheer for a New School Year! Create or borrow a class cheer to pump up enthusiasm for the school year ahead. New school terms often coincide with new seasons in sports. Use students’ interest in “getting in the game” to help catch and keep their attention in class. Announce that you’d love to begin class with a game of _____________________ (name of a sport that’s in season and popular in your community), but “alas and alack” it’s time to get to work. Make an immediate follow-up announcement that you do, however, have time for a cheer to start the day in a positive way. Create or Borrow a Cheer for the New School Year! – Lead kids in a quick class cheer that you create or borrow ahead of time. Tell kids that you want to keep the pep rallies going all year long. 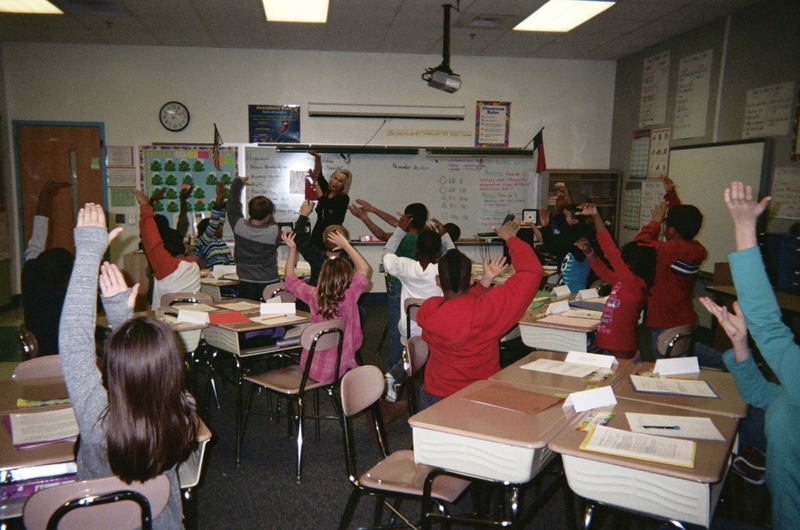 A school starter cheer is a great way to pump up enthusiasm for the day ahead. Creating or borrowing a cheer for a new school year encourages everyone to get involved in class activities, including lessons! Upbeat cheers (are there any other kind?) may offer the extra benefit of engaging reluctant learners. Likewise, students who show up at your classroom door sad or angry may brighten up when they have the opportunity to shout out a cheer and chase away bad feelings. Here’s a cheer for a new school year that I’ve written. Use it if it suits your grade level and goals. The school year’s just begun! 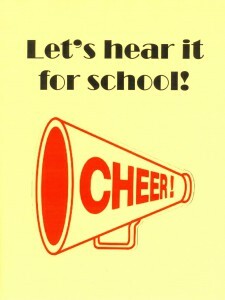 What other cheers can you create or borrow to cheer on a new school year? “Up we go, down we go, all around the world we go.” Use cheer-like word play to help children grasp the concept of a global economy. Effective communication skills, teamwork, creative and critical thinking, and empathy are keys to success in a global economy. Global commerce may not seem to impact any one of us on a daily basis, but children benefit from knowing that behind even the smallest and/or local sale or purchase, a global economy may very well come in to play. 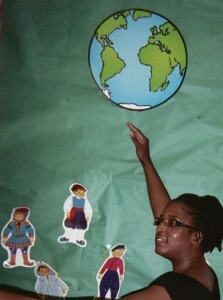 One way to help young children grasp the concept of a global economy is to cheer them on to understanding. Cheer for S.T.E.M. – Esteemed educators and authors, including Tony Wagner, encourage teachers to embrace the concept that we are transitioning from a knowledge-based economy to one that is based on innovation. The big question…how can educators prepare children for a world in which many of the jobs they will likely hold as adults have not yet been created? It seems that there is call for a cheer for S.T.E.M. (Science, Technology, Engineering, Math) education that focuses on teaching advanced communication skills, empirical thinking, teamwork (Go Team! ), imagination and creativity to solve problems…key skills for success in a global economy. Repeat the cheer with the class. When you create or borrow a cheer for a new school year, you can place key words in children’s minds through the ease of rhyme and the magic of repetition. I – N – Q – U – I – R – Y is an important word to place and practice. Inquiry is embraced and practiced by curious minds. To cheer on curiosity in children is to help them prepare for adulthood in the 21st century. Here we are entering the close of 2015 and preparing to open 2016. Name any subject in your curriculum this school year. Challenge yourself and colleagues to collectively create or borrow cheers for the term ahead that support your curriculum in a way that is similar to a cheerleader supporting a sports team. ‹ Take Kids on Make Believe Vacations! 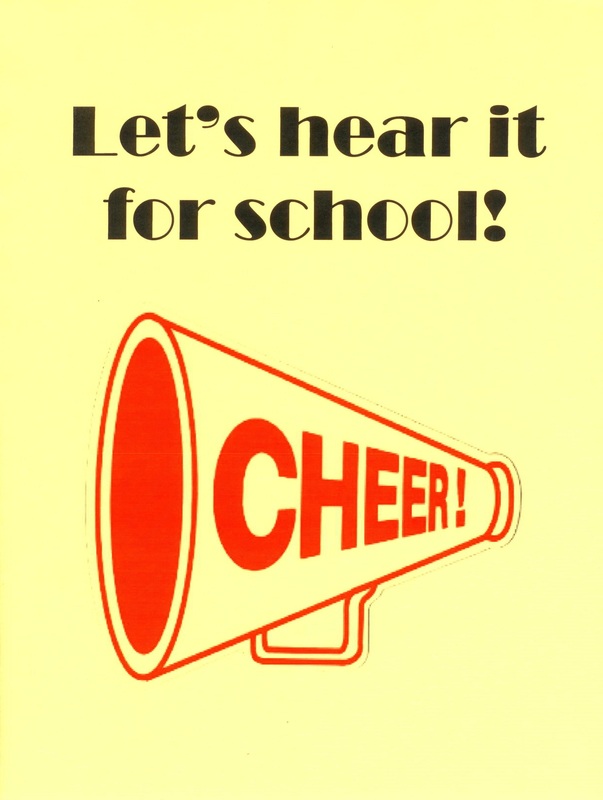 1 Pings/Trackbacks for "Create or Borrow a Cheer for a New School Year!"